While driving the other day, I was forced to stop... not for cow traffic but for helicopter tree transport. There are houses here in Gstaad that are so difficult--if not impossible--to reach with trucks that helicopters are used to transport heavy and oversized items, like this pine tree. 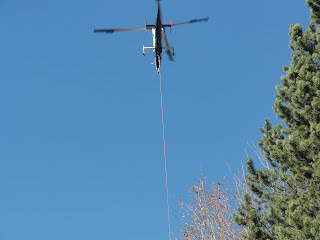 The helicopter picked it up behind an embankment to my right, flew over the road, and deposited it on the other side. It was very loud... and thankfully... very fast. Last week's Swiss parliamentary elections resulted in left and right parties losing votes and seats in the Nationalrat or Lower House. Losing the most votes was the Swiss People's Party (SVP), this country's right wing party best known for spreading xenophobia with its provocative posters. Remember the three white sheep kicking one black one out? Upon reading the voting results, I sighed in relief for my American half and for my foreign friends. Perhaps, the strong Swiss Franc cannot be blamed entirely for the drop in occupancy rates in area hotels. I have often thought that Switzerland was a land of contradictions. For example, our municipality nearly always votes SVP. But, I've noticed a rash of rich foreigners buying property in our area. How can a region sell property to foreigners and grant them large tax breaks while voting to stop immigration? Money? No! Duh! Coming came down from the mountains to get some shopping done in Bern didn't turn out that way. I ended up checking out a few churches and walking through the old town. While rushing to check out at our local Coop grocery store this morning, I found myself in line behind a woman arguing for a refund in broken French. I slowly emptied my cart of its contents--amazingly fresh organic vegetables and fruits--onto the conveyor belt and listened. The woman explained in broken French that she had purchased six yogurts, and six yogurts only, and she felt she should be paid out SFr 80. The checkout girl, who was obviously Swiss German speaking, nodded her head, filled out a yellow slip, and answered the woman in even worse French. If you haven't been to Ballenberg yet, I urge you to go. 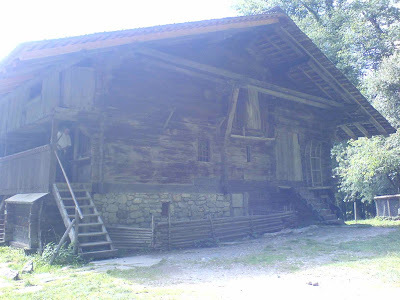 Ballenberg is an open-air museum located near Brienz. 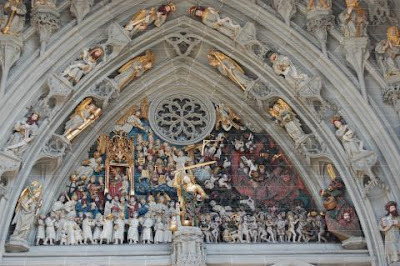 There, you will find more than one hundred century-old buildings from all over Switzerland as well as farmyard animals, demonstrations of traditional crafts, vegetable gardens and fields and more. Houses are grouped according to region and are linked through a series of paths that lead through enchanting rolling hills and forests. Ballenberg closes for the winter Monday October 31, 2011 at 5 p.m. The museum reopens Good Friday, April 6, 2012. For more information, click here. 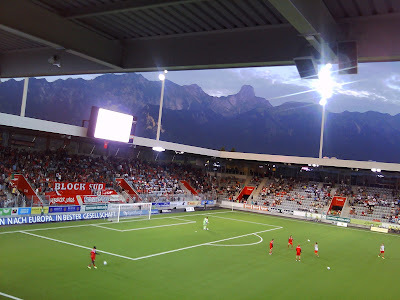 If you ever get a chance to go to a football game in Thun, we recommending getting an upper level seat facing the mountains. This past August, we enjoyed an incredible sunset, while watching the beefy Brits score their one goal against the lithe and quick Swiss. Better next time FC Thun! A few days ago, the children's school fall holiday began and we hopped in the car and drove south. Six-and-a-half hours later, we arrived in the Principality of Monaco. When we left the Alps, mid-day temperatures hovered in the single digits; and when we arrived at our destination around midnight, we rejoiced at feeling 18 degrees C.
During out stay in newly married Prince Albert's land, I was struck by more than just balmy temperatures. 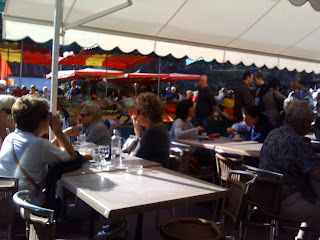 While enjoying a black coffee and writing post cards under the arches of the Place d'Armes, I sat back and observed the scene around me. It was Sunday, yet a produce market was in full swing. Stylish women wearing sunglasses and carrying wicker baskets picked up and sniffed red peppers; salespeople argued loudly about politics; children played at a nearby playground while their care-keepers chatted. 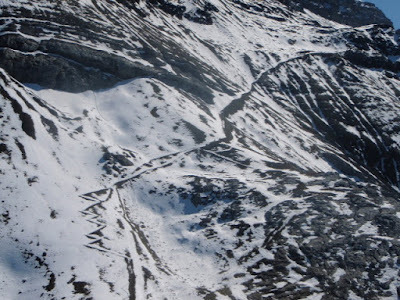 A few weeks ago, I over-exerted myself by going on a hike from Reusch (1,350) to Scex Rouge (2,971m), the last part of the Glacier 3000 Run course. It may have been an unwise idea for me to attempt 1,621 vertical meters for my first hike of the year. The two girlfriends who had invited me, had--unbeknownst to me--been going on weekly hikes since April, one of them actually participating in the Glacier 3000 Run. I figured if people can run up that mountain, I could certainly walk it. I had been running five to six miles on the flat four times a week all summer. In the USA, the eff-word is generally considered obscene and reserved for rated R or PG-13 movies. In Switzerland, where there are rules for everything, none seem to exist to prevent the commercial use of such a word. And here in the Swiss Alps, the eff-word seems to have passed our local skate park propriety test. 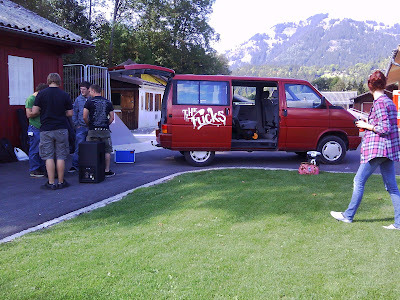 We thought the noise emanating form the van's speakers was well paired with the name of the local band "The Fucks." The what? That's right! Perhaps, we're simply getting outdated... although my children thankfully agreed with me. I've had my driver's license since I was 16 years old. Granted, the test that I took in Middletown, Rhode Island, was easy. No highway driving and no parallel parking were required, (although I had practiced it with my instructor). All I was required to do was drive around the block, use my blinker and execute a three point turn. Voilà! The most valuable driving knowledge I have collected during the past 24 years, I've learned on the road. Like the day I drove a friend from Newport to Cape Cod and forgot to look over my shoulder to check the blind spot before passing a car on the highway. Thank goodness my friend yelped, as I could swerve back into my lane on time and avoid an accident. Or the four times, I lightly hit a car in a parking lot, because I misjudged the distances or forgot to use my mirrors. Thank goodness we had snow during the Christmas holiday. We could ski nearly every day of our two-week break. Since then, the weather has warmed up considerably, to the point that we have been sunbathing in T-shirts in front of the house. The sun has done wonders for our Vitamin D levels but wrecked havoc on the snow. Grey-green patches are now visible on many a southwest-facing slope. Some mountains have closed their lifts. With worried frowns on their faces, locals say in hushed voices: "This is April weather. 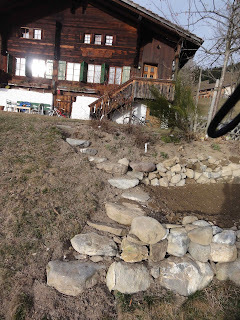 It doesn't look good for the rest of ski season. We need more snow."